SKF is currently building the world’s most powerful large size bearing test centre on its Schweinfurt ‘Werk 3’ site. This pioneering project is now one major step nearer completion – weighing in at around 3 000 tonnes, it took just two days to cast the foundations for the larger of the two new test rigs. Around nine metres wide, six metres deep and 22 metres long, the pit that had to be filled for the base of the future SKF test rig was the size of two detached houses. It had to be filled quickly to ensure the concrete could set correctly. Quite apart from that, the future test rig will also allow rotational speeds on testing that will be considerably higher than currently available. Using these exceptional capabilities, SKF wants to simulate extreme dynamic loads of the order of several meganewtons or meganewton metres in as realistic a manner as possible. In view of power capacity of this order, the engineers from RENK Test System GmbH, the firm entrusted with the development, even had to come up with a special fixing method that would direct the forces exerted on the station in a controlled manner along the correct paths. “In the final analysis, the 360 MSEK investment in the new test centre will help us customise large size bearings to their subsequent uses much more precisely and efficiently than has previously been possible,” says Manfred E. Neubert, President of SKF GmbH. “This means that our customers benefit from significantly higher levels of robustness and reliability in the new generation of large size bearings.” For SKF itself, the new test centre is like one of those final pieces in a puzzle soon to be completed, adding to the expertise in large size bearings already available on the Schweinfurt site. 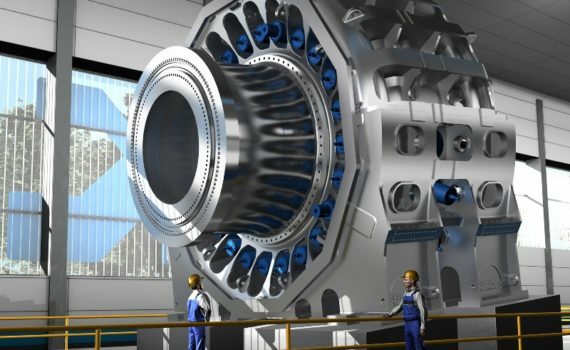 Follow the construction of the world’s most powerful large size bearing test centre: http://skf-download.de/pruefzentrum/cam1en.php.